If you are planning on a Christmas vacation or a trip to France at some point, it is important to learn French greetings. French people place a lot of importance in courtesy, and will take a liking to tourists who behave nicely and use basic French words and phrases in normal and everyday conversations. Contrary to the negative stereotype shown by a lot of films and TV shows, the French people are neither arrogant nor rude. They will not deride tourists who speak French. They tend to smile at strangers when greeted in a friendly manner, and those that you have acquainted yourself with will even help you if your pronunciation isn’t good or wrong. One thing you have to remember is that you have to speak quietly if you are in a public place such as the mall, or in public transportation. Otherwise, they may find you callous and rude. Even if you are not traveling soon, learning these sets of phrases may help you prepare in knowing what to say or do when you communicate with French natives either on the Internet or if they visit your own city. Greetings are called “La rencontre” in French, which roughly translated means “the meeting”, or “les salutations”. You will find that the proper greetings tend to change depending on whether the two adults concerned are already familiar with each other. For example, if two people who don’t know each other met and would like to exchange pleasantries, the initiator would say Bonjour, which literally means “Good Day”, which allows it to be used in the morning and in the afternoon, although some people will use it after 6 in the afternoon without any problem at all. 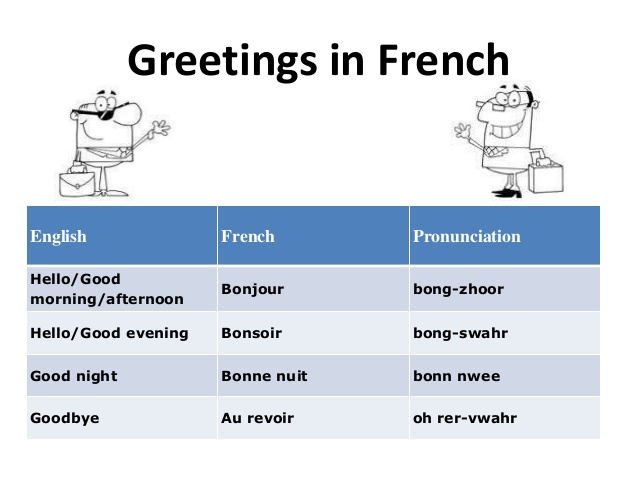 If the person greeting would like to be more specific about the time of day, he can substitute Bonne apres-midi, which means “Good Afternoon” or Bonsoir, meaning “Good Evening”. People will reply with the same christmas greetings, which means a “Bonjour” will get another “Bonjour” as a reply, while a “Bonsoir” will get a “Bonsoir”. When two people who are already well acquainted with each meet, they tend to greet each other differently. For instance, instead of saying Bonjour, the initiator might ask “Comment allez-vous?” which is equivalent to asking “How are you?” in English. The other person may then reply with “Je vais tres bien, merci?” which means “I am fine, thank you.” The word “vous” in this situation may be replaced with “tu” , which also means “you” if you are greeting a family member or a very close friend, whereas “vous” is of a more formal tone, which may be used with a boss or a senior. This short example is barely scratching the surface of greetings in the French language, but I hope it has helped, since learning to greet and meet people is one of the most important parts of learning a new language, and may help further ones practice by allowing you to strike up conversations with people that you don’t normally speak to.